Regarding "increasing numbers of Supporting Members", there's one related arcane bit of information you should know. Voting in the Site Selection process automatically gives you a supporting membership in whichever con wins -- which in turn gives you the right to nominate and vote on that con's Hugo Awards. So there are fans who will always vote in the Site Selection specifically for that reason, whether or not they think they'll attend the Worldcon itself. I think many USAians will vote for a Worldcon in another country so they have an excuse to go there and be tourists. Although I can see some truth to that, international travel is also financially out of reach for many of the fans I know. But some of these same fans support international Worldcons because they feel it's better for the community. Some North American fans worked hard to build stronger connections with fans around the rest of the world, with the idea it would lead to more overseas Worldcons. For example, LA fan Milt Stevens served in the Navy and made friends with Japanese fans when his ship called in Yokohama. LASFS started the tradition of including the Seiun Awards in the Hugo Awards ceremony. Later, Washington, DC fan Peggy Rae Pavlat organized an effective North American campaign on behalf of the Nippon 2007 bid. For the fans who regularly work on Worldcons, site selection is about voting for where they want to work on a Worldcon and who they want to work with. Getting to know fans from other countries by working with them, at their Worldcon, in their country, can be a life changing experience. You want to do it again. I think it's safe to say that there are still plenty of fans out there with very little money. And international travel isn't always more expensive -- I heard grumblings about how difficult it was to find reasonable flights to Spokane, for example. It certainly makes sense that, for fans on the inside of con organization, voting would have as much to do with the people as with the place. But I wonder how much of that is visible to the wider WSFS membership. People often underestimate how expensive (both in time and money) travel across North America was 50+ years ago. Many less wealthy fans could afford to attend some Worldcons even then. That is an entirely fair point. Transcontinental travel has changed quite a lot over that time. 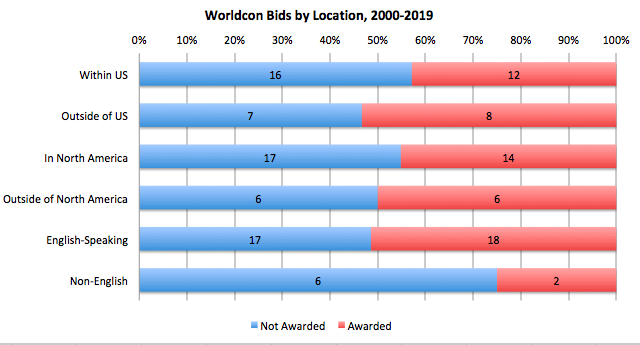 Apparently I just picked bad years to consider attending WorldCon, or perhaps I didn't pay enough attention to descry bids versus confirmed locations or something! You're welcome! Glad you found it interesting. It's possible that what you're noticing is the change in recent years, where there are more non-US bids, especially non-North American bids, and more of them are winning. -- was a real bid, with a venue and dates and estimated costs etc. Thank you so much for this info! I have updated the spreadsheet accordingly. 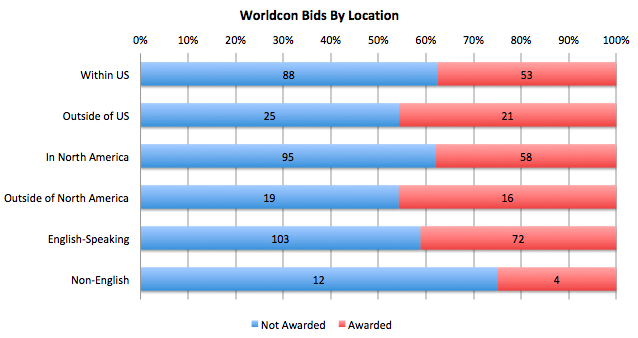 I find it quite interesting that Worldcon classified it a non-North American bid, given that Puerto Rico hosted NASFiC last year. So is the Caribbean considered a part of North America, or not? I'm not sure about the classification, so I've emailed Neil Rest (with a link to here), who ought to know. I only remember the casual discussions among people not involved with the bid, so I'll leave it to someone with Actual Info. 4.8.5: For the purposes of this Constitution, North America is defined as: Canada, the United States of America (including Hawaii, Alaska,and the District of Columbia), Mexico, Central America, the islands of the Caribbean, St. Pierre et Miquelon, Bermuda, and the Bahamas. Thanks for looking this up! I am guessing, based on Neil's comment below, that this language was added to the WSFS constitution after the old zone system was discontinued. So that would mean that Bermuda wasn't in North America under the previous system, but it would be considered to be now. I'll fuss with full registration &c &c when I'm not on my phone on the bus. At the time of the Bermuda Triangle bid, Worldcon bidding rotated between 3 North American zones defined in the WSFS Constitution, with "outside North America" eligible any year. The Caribbean wasn't included. I think that addresses the immediate "fine print" point. Tasty, tasty data--thanks for this work. The 1989 New York City bid was considered serious by the people running it. It was not actually feasible (inadequate facilities).